accompanied with the 52nd Annual Congress of Japanese Society for Oral and Maxillofacial Radiology(JSOMR) will be held on May 25th to 29th, 2011. This congress is approved by the Royal College of Radiologists (RCR:United Kingdom) as CPD Event. '11.04.14…The early registration is extended to April 25th. '11.03.31…The early registration is extended 2 weeks. The main stream of the concept of this logo is the flag of Japan. Red and white are used. 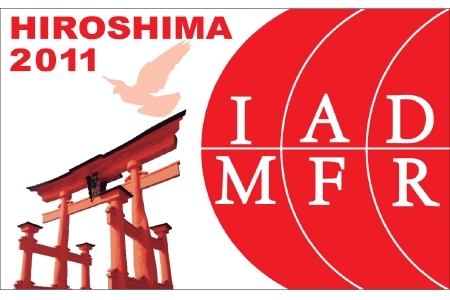 The right IADMFR logo is imaged as the red center circle of Japanese flag, which means the sun. The sunshine pours a lot of radiations. In the white background, you can see a dove and Torii. Torii is a Japanese word, which means a gate of a shrine. This Torii is the symbol of Miyajima, one of the 2 world heritages in Hiroshima. Miyajima is the name of a holly island, which has Itsukushima Shinto Shrine, the main attraction of Aki no Miyajima, long known as one of Japan's "three beauty spots. The LOGO means “Radiation and Peace” in Hiroshima! The early registration is extended to April 25th. iadmfr2011 since 2009-08-21 / Copyright 2009 IADMFR2011. All Rights Reserved.